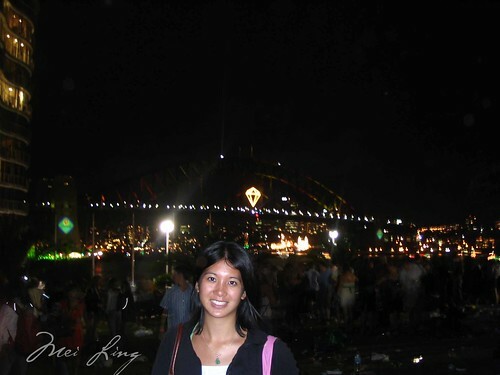 Not only did I spend Christmas 2006 in Sydney, Australia but I spent New Year’s Eve there as well. 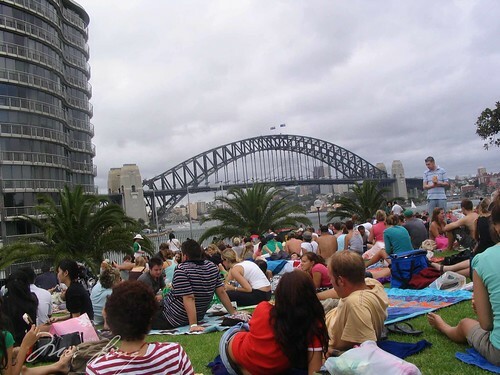 Sydney is known for their spectacular fireworks, so my friends and I decided to picnic by the observatory near the botanical gardens where we had a good view of the Sydney Harbour Bridge. Heading to our picnic spot for New Year’s Eve. 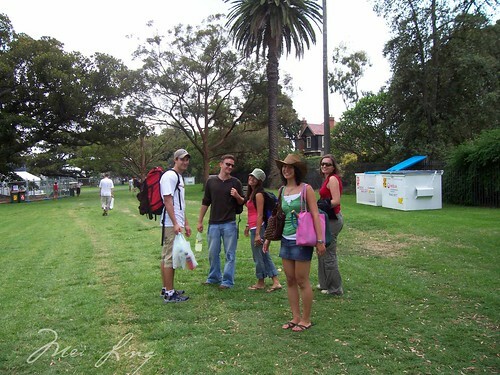 We arrived as soon as the sites opened up in the morning to ensure we got a good spot. Our sleeping bags made excellent picnic blankets and we packed magazines, water, snacks, sparklers etc. to help ring in the new year. Getting to the observatory was very organized and they had security check our bags before letting us in. They were also diligent about the rules (e.g. no tents allowed. 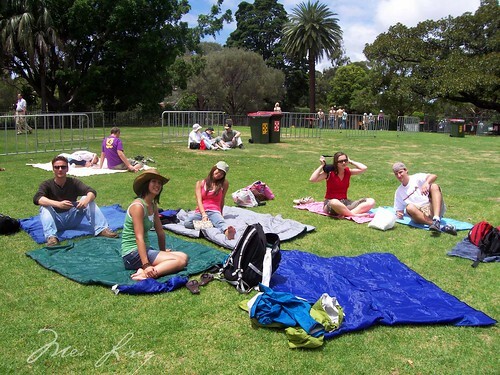 They made a woman take down her sun tent because she was obstructing the view of the people behind her). 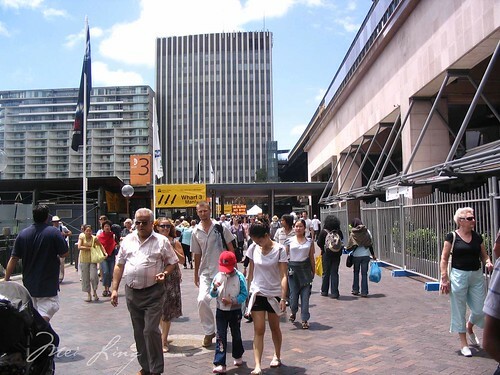 The security line to get to the New Year’s Eve sites around Circular Quay. 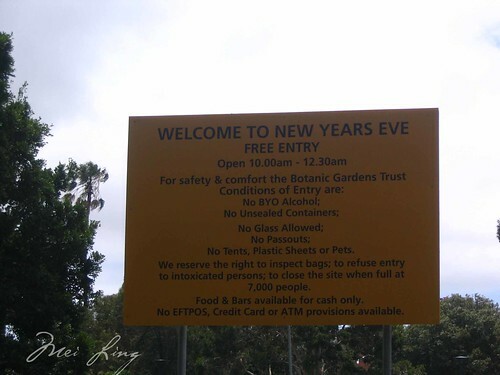 Rules for New Year’s Eve. After setting up our spot, we waited…for a very long time. It’s all part of the experience so we were patient. There were vendors selling food so we were able to eat. 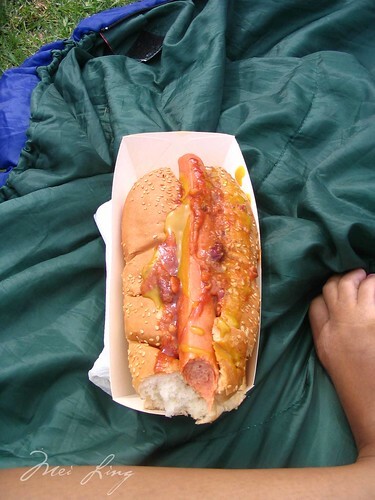 The last thing I ate in 2006 was a chilli hot dog. It was delicious. All set up. Now we wait. My view of Harbour Bridge. Not bad. The last thing I ate in 2006. Yum. 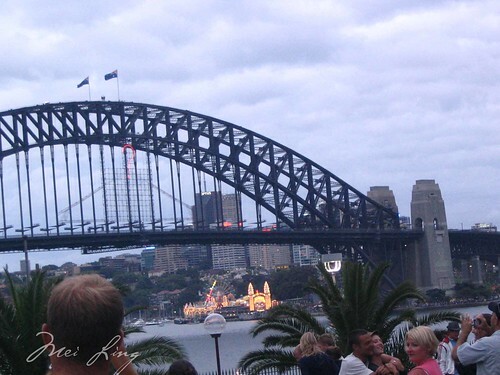 As the sun set we started to see a faint outline of a question mark light up on the Sydney Harbour Bridge. The question mark eventaully turned into a coat hanger, which is one of the bridge’s nickname (the great “coat hanger bridge”). Dan and I had climbed the Harbour Bridge when he had visited, so to this day it holds a special place in my heart. A question mark started to light up around dusk. We could also see Luna Park. 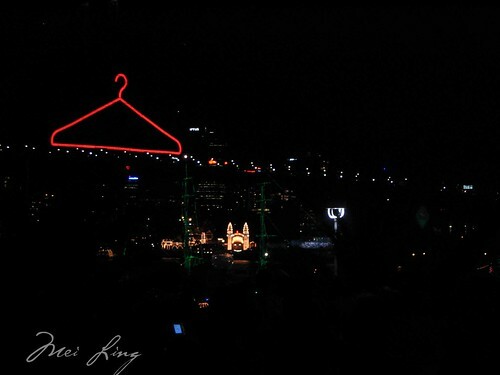 The coat hanger lit up on the bridge and Luna Park in the distance. 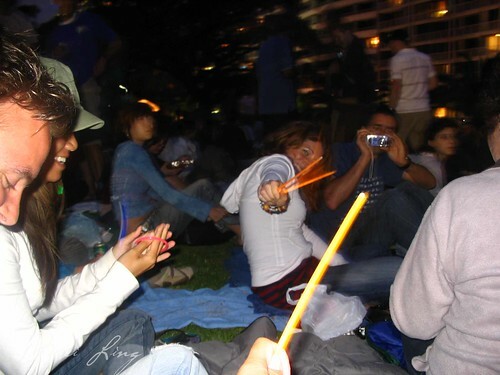 When it got dark we took out our glow sticks and started to wave them around. Finally we were approaching midnight and we counted down. When we screamed “Happy New Year!” there were a few fireworks but not many. “Is that it?” I asked my friend. If that was it I was going to be severely disappointed. It turned out to be just a teaser and what followed were some of the most magnificent New Year’s Eve fireworks that I have ever seen in my life. 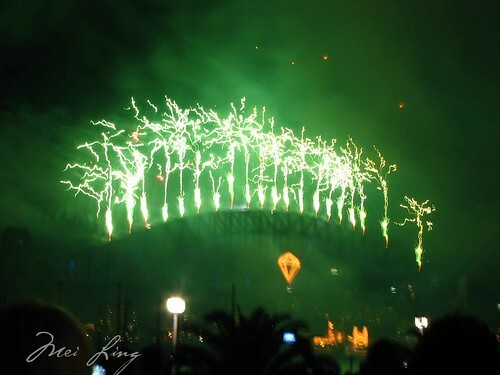 Sydney is known for their fireworks for good reason. Our vantage point was good except we were a little bit behind the Sydney Opera House, so we couldn’t see any of the fireworks highlighting the Opera House. 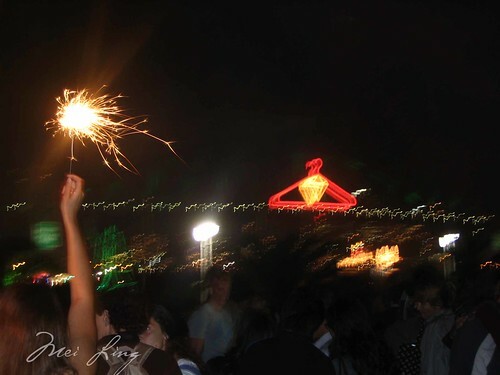 This wasn’t a big deal though since most of the fireworks are centred around the bridge. The end of the fireworks always reveal a new secret symbol on the bridge as part of the theme. This year it was a diamond to go with the theme: “A diamond night in Emerald City.” It certainly was a diamond night! 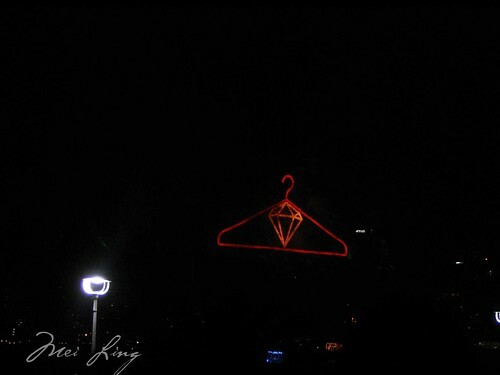 The coat hanger and the diamond. 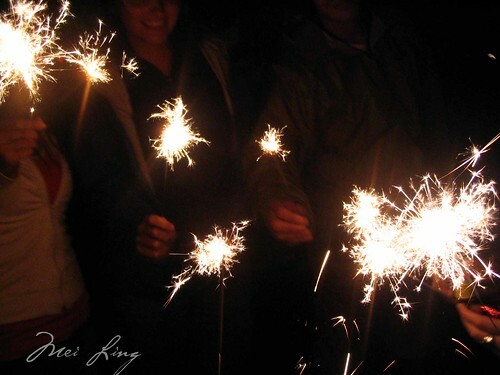 Fireworks. It certainly was a diamond night in Emerald City. 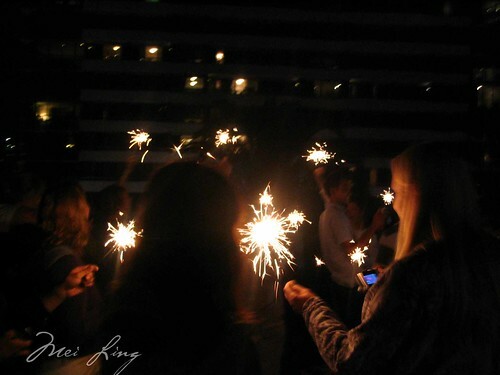 After the fireworks my friends and I lit our sparklers and waved them around, blowing noisemakers and cheering with the rest of the crowds. 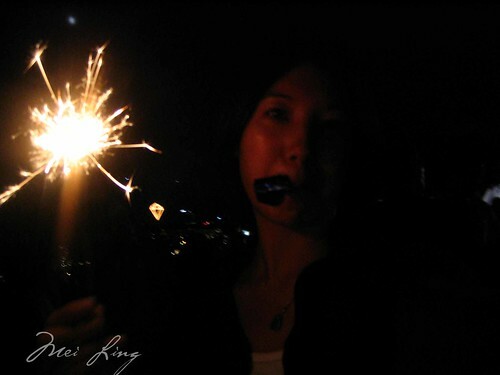 Selfie with my sparkler and my noisemaker. Sydney certainly set the bar high for me on how I like to spend my New Year’s Eves! What a way to bring in 2007. Me with the Sydney Harbour Bridge at the end of the night. Hello 2007! Cool! I hope to experience that too one day.